But Pandora has opened another box and you can put it on your NOOK Tablet. Think of Pandora as your personal electronic disk jockey that starts with a few songs or artists you like and then finds music that’s similar or shares certain attributes. You get to create and fine-tune your own stations. You can have as many as 100 channels and play just one, or rotate through them all, or ask the tablet to play randomly. The basic Pandora Internet Radio service is free, but an enhanced, commercial-free subscription is sold for certain devices. The Pandora app on the NOOK Tablet only runs the free (with advertising) version; however, if you go to the web browser on the NOOK Tablet and visit the Pandora website, you can use the full site for free or sign up for ad-less music for a reasonable annual fee. Pandora gives you a personal musical curator on the Internet. To use Pandora you must have a membership; it’s separate from your account with Barnes & Noble. If you have a previously established Pandora account, you can sign in to it from the NOOK Tablet; if not, you can set up one from the tablet or from a desktop or laptop computer. You must have an active WiFi connection to listen to Pandora; it can play in the background while you read or shop or use other elements of the NOOK Tablet. Use the Home button on the quick nav bar to move somewhere else. 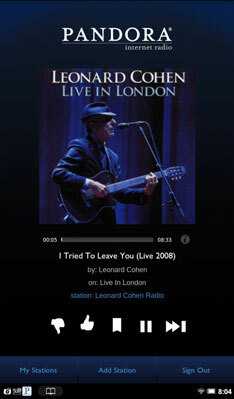 While Pandora plays, a small P icon appears on the right side of the status bar. Tap this icon to return to the Pandora app.